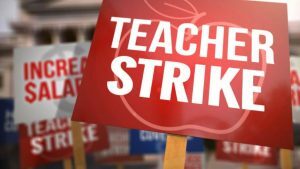 Pueblo teachers go on strike Monday for three days, maybe a week, however long they think it will take the school district caves to their demands. Here’s the school board offer that was rejected last week by the teachers union. D60’s offer included a one-time payment equal to one percent of teachers’ salaries (or a one-time equal payment of $500 to all teachers), adjustments to salary schedules for 2018-2019, a cost-of-living adjustment of 2.25 percent of salary for 2018-2019, and a $30 increase in the district’s contribution to the cost of health insurance for 2018-2019. Union leaders have repeatedly said that nothing short of the district honoring the fact-finder’s recommendations for the current school year — a 2 percent COLA and increase of $30 per month in health insurance benefit for teachers, and a 2.5 percent COLA and step for parapros (assistants and aides)— will resolve the stalemate. Pueblo school officials say teacher salaries have increased $2.7 million and paraprofessionals and assistant salaries have increased $3.4 million over the past four years. This will be the first teachers’ strike in Colorado since 1994. There’s been an uptick in teacher union activities nationwide as the country heads in the midterm elections, so this may not be the only disruption we see in the state.